I visited the Tianzifang Quarter for the first time in Septembre 2013, together with a very good friend of mine, as it was a « requirement » for our Chinese Society class. We went there with a critical, yet enthusiastic eye, as we would be able to complete our assignment, and do some sightseeing at the same time. All the travel blogs and city guides recommend to visit Tianzifang, which is presented as an artsy bubble in the busy and international city of Shanghai, where one can experience local art and culture. Our professor, a lovely researcher in anthropology, told us that Tianzifang was a culture-led rehabilitation project, accomplished in the absence of any urban planning or government intervention. Yet, the two of us and the students came back with mixed feelings, and described Tianzifang as « quite commercial », with not so many local people inside the shops, even though we recognized that the atmosphere was also very different from other commercial projects, and that the architecture had been well preserved. Our professor did not expect such a report at all, and she said that it must have changed quickly; a few years ago, some students who completed the same task had a completely different feedback, and herself appreciated the calm and arty atmosphere of the place at the time. Tianzifang was about 14 years old in 2013, and like a teen, it was changing very fast. 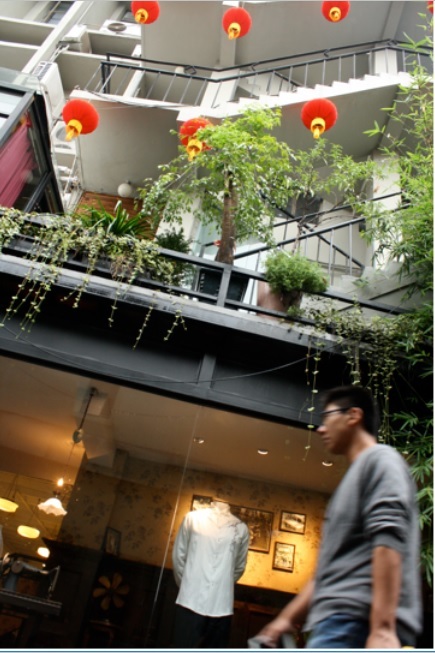 The 210 Lane on Taikang Road, now known as Tianzifang, was build in the early 1930s, in the French Concession of Shanghai (in the current Luwan District, Dapuqiao Area), to accommodate immigrants from the countryside. The neighborhood was build in the predominant Shikumen style (literally, stone door), which had emerged in the 1850s, as a mix of Western and Chinese architectural styles. A stone gateway on Taikang Road led to a narrow lane (a lilong, the Shanghaiese equivalent of the Beijing’s hutong) flanked by three level-high houses. Traditionally, the ground level was used by some kind of proximity shop, and the families were living in the higher floors. In 1940s and 1970s, small factories were built in the neighborhood; they closed down in the 1990s, during the economic reforms lead by China’s Premier Zhu Rongji. The story of Tianzifang as we know it started in 1998. Turning the decrepit industrial neighborhood into a cultural district was neither the locals nor some artists’ idea, but rather that of Zheng Rongfa, the administrative head of the Dapuqiao area. Zheng leased out a space of 10,000-square-meter occupied by the abandoned factories on a 20-year contract. The following year, Wu Meisen, who is also often referred to as « the father of Tianzifang » or its « planning director » and who introduced himself as the first tenant of the industrial buildings, rented the remaining space (either directly from the factories’ landlords, or from the subdistrict government, depending on the sources, which are probably a same person, as before the 1990s, the factories were owned by local governments..). The mysterious Wu Meisen, who indicated that he was not a government official, but used to work for the Trade Union of the Workers of Luwan District before going to Canada when China opened up, also a friend of the artist and member of the Shanghai Chinese Painting Academy Xie Chunyan, contributed to invite Chinese artists to move in. 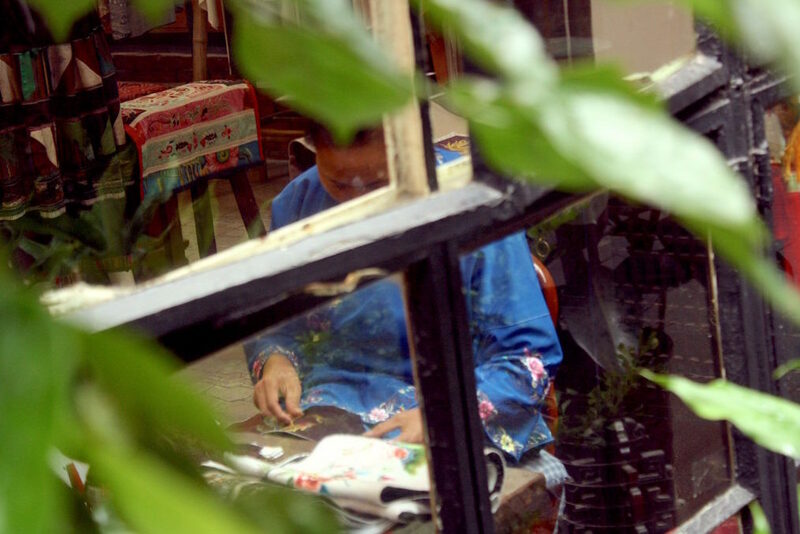 In 1999, the famous painter Chen Yifei, the photographer Er Dongqiang, and others, installed their studio in the 210 Lane. The same year, the painter Huang Yongyu renamed the place after the painter Tian Zifang, who, according to the story, was chosen by the King Song Yuan (531–517 BC) for his paintings. From the battle against demolition to the pressure of rising rents. In 2004, Tianzifang was threatened to be torn down. Indeed, the local officials were aiming at replacing the old factories with new high-rise residential projects and malls. Zheng Rongfa and Wu Meisen were opposing this decision and managed to gather the residents and artists to resist the local government. From Lane 210, Tianzifang was enlarged to the neighboring 248 and 274 lanes in order to « boost its significance« . The first local to rent his place to an artist was Zhou Xinjiang, the China Daily states, a retired Chinese man whose decision was above all motivated by the fact that his pension alone could not cover his expenses, Zhou admitted to the media. Besides, some intellectuals were also defending Tianzifang, and the theory of creative industry zones of Shanghai’s Economic Research Institute’s Li Wuwei was making adepts. Eventually convinced by the economic soundness of the Tianzifang Art District, the local government dropped its demolition plans, and was associated to the management of Tianzifang. In April 2008, the Tianzifang Management Committee was established, in addition to the pre-existing Administrative Committee of Taikanglu Art Street (set up in 1999, responsible for the management of the factories’ leases) and the Shikumen Owners Management Committee (set up in 2004 by private individuals, responsible for the definition of renovation rules and intermediary between owners and tenants). Headed by Wu Meisen, and gathering representatives of the local residents, the artists, and several government units, Florence Padovani specifies, the Management Committee is responsible for the legalization the mixed usage of the buildings, improvement the infrastructures, the supervision of the renovation of the area, but also for fixing goals in relation with cultural creation. In 2010, Tianzifang was ready for the World Expo. The Dapuqiao Metro Station located on Taikang Road opened in December 2009, and as soon as in 2006, Tianzifang had already been recognized as China’s first creative industry park. But Tianzifang’s success is also a new source of challenges for the artists and local residents. Art studios have developed, but bars and restaurants have blossomed, and with them, rents are increasing. Yan Hongliang, who sells ceramics, told journalists that he is paying currently paying 40,000 yuan a month for his 60-square meter shop, while nine years ago, in 2007, he was only paying 6,000. And the rent could even reach 60,000 yuans in 2018, when the contract will be renewed. As a consequence, it is difficult for artists to afford the rent, and the art studios are slowly being replaced by retail stores. According to Yu Hai, a Fudan University (Shanghai)’s sociology professor, cited by China Daily, only 2% of the stores in Tianzifang would be occupied by art studios or galleries as of 2016. The rising rent and the noise are also pushing aways local residents. The researcher in urbanisme Zhang Hao indicates that by 2012, 590 households already left the area. Living the Local’s life: who dreams of what? As for the local government and institutions, they praise their role in the creation of this unique and « harmonious atmosphere in which people can experience the traditional urban life in old Shanghai (1) » while the government-controlled papers suggest not only to listen to the locals’ claims and improve public hygiene and infrastructure, but also urge the local authorities to « make [Tianzifang] more tourist-friendly for foreign visitors, which is beyond the ability of local residents » (See for instance this 2015 article from the China Daily). (1) Intestingly, Wu Meisen also likes to refer to Tianzifang as the « Small United Nations » of Art and Culture, considering the important number of foreign artists or entrepreneurs established in the area. 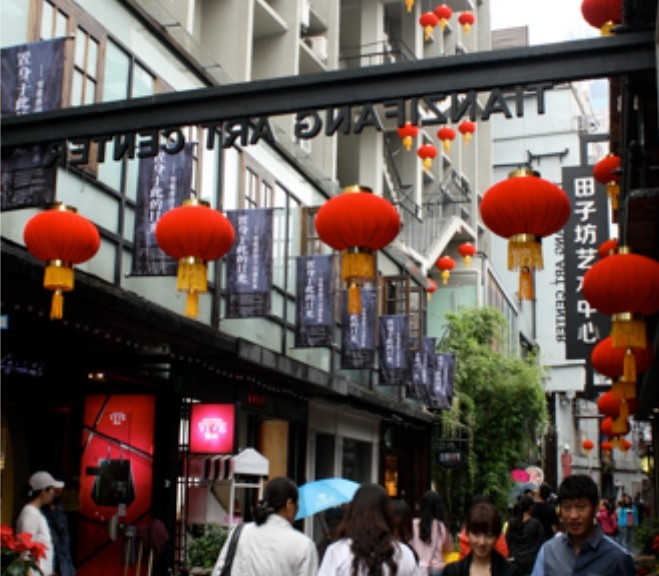 18 different countries would be represented in Tianzifang, and the largest group, the Japanese, even set up a Business Association representing their interests. But after all, wasn’t Shanghai very international at its golden age, in the 1920s? Z. Hao, « Tianzifang: Community or Tourism? », ComplexCity, June 16, 2014, accessible here. L. Huang, « Welcome visitors -but not yet », Global Times, June 15, 2015, accessible here. F. Padovani, « Tianzifang, une redéfinition de l’image de Shanghai », presented at the 4th Congress of the Asia & Pacific Network, September 2011, accessible here. H. Shinohara, « Mutation of Tianzifang, Taikang Road, Shanghai », presented at the 4th International Conference of the International Forum on Urbanism, 2009, accessible here. R. Yu, « Creative hub painted into a corner », China Daily Asia, July 8, 2016, accessible here. J. Zhang, « Wu Meisen: A man, a place, a dream » (Wu Meisen: yiren, yifang, yimeng), Beijing Review, March 18, 2010 (Chinese version here, French version there).